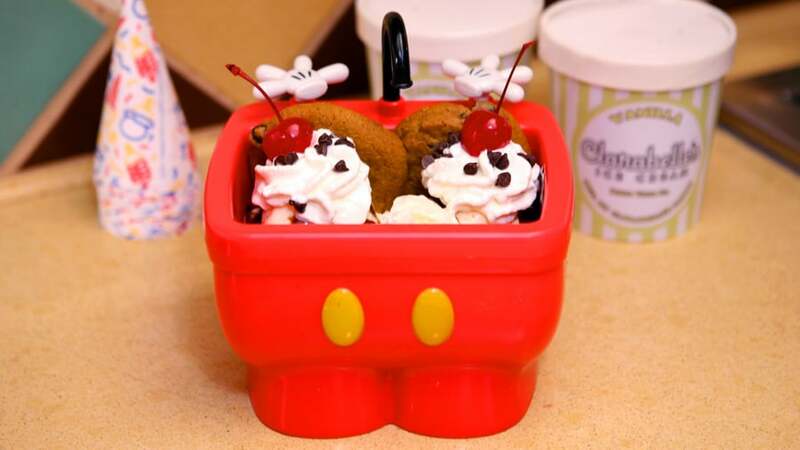 Enjoy this totally Disney dessert at The Plaza Ice Cream Parlor at Main Street U.S.A. or Beaches & Cream Soda Shop at Disney’s Yacht Club. It’s more than enough to share! At the Plaza, it features two scoops of your choice of ice cream; at Beaches & Cream, it features four scoops! From there, it’s topping after topping—chocolate sauce, caramel sauce, strawberry sauce; it’s your choice—one, two or all three. That is then topped with chocolate chips, peanut butter chips and even mint chocolate chips! Whipped cream and cherries finish this dessert so you can too!